I have taken much of a decade (so it feels like!) to write this post! In all honesty, when I decided to bake a Génoise last week, it was intended for my bestie's grandma! 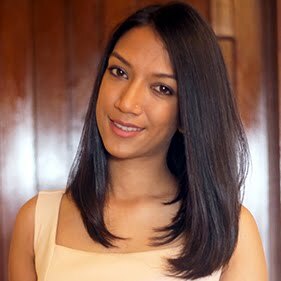 But when I told, Le Monsieur, A, that my sponge cake came out beautifully spongy and airy, he couldn't help but ask that I bake him one! A big one for himself, you ask? I bet, if he was not much of a healthy-food freak, and not much attentive to his round tummy (pretty sure you have your head tilted down looking at your tummy if you're reading this right now! 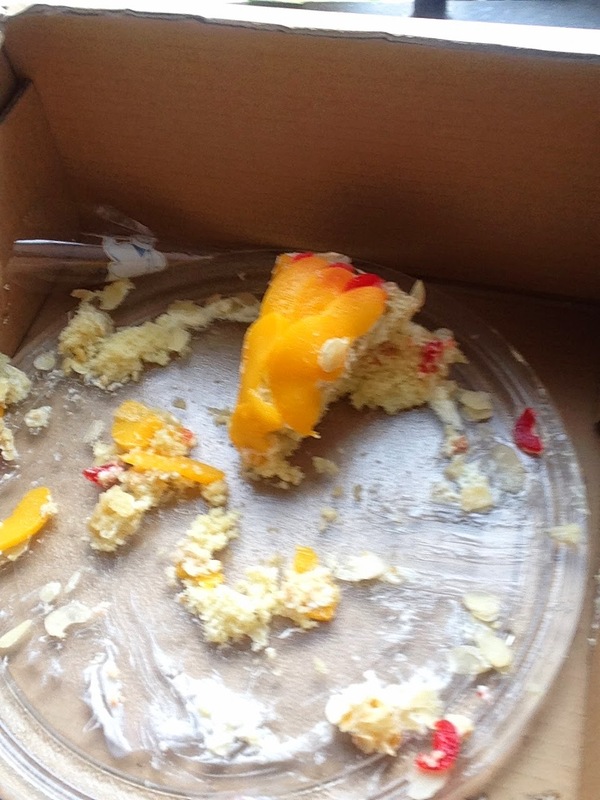 ), he would have had the cake all by himself! 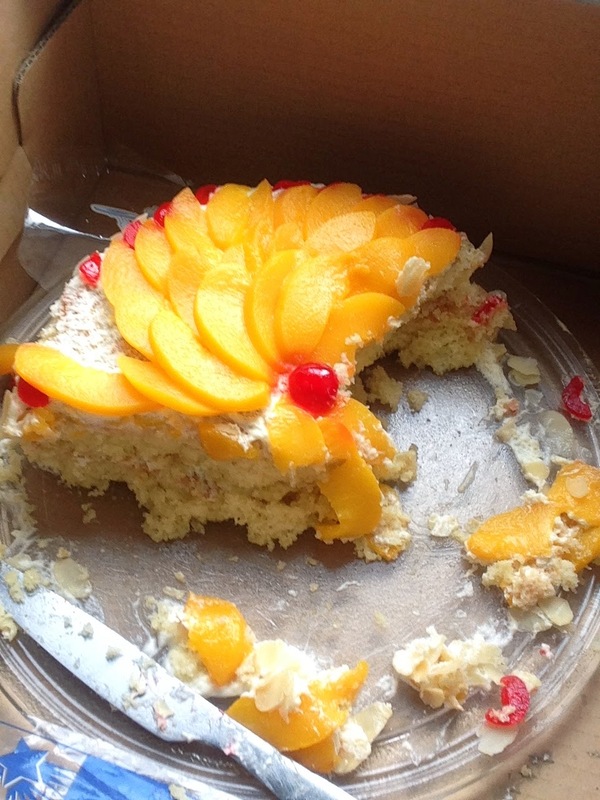 So no, he actually shared with everybody at work, sparing not even half a bite for me! You have it all figured out, it was that good!! I haven't had the chance to ask him to describe the cake for me, or rather I did not bother at all when I looked at the photos - of the cake updates - he sent me! You'll find them at the end of this post! So, when your boyfriend's or girlfriend's, or friend's, mom's, dad's, whoever it is, birthday is around the corner, don't head to the bakery shop and buy them the usual Génoise we've all had since we were kids! Make this Easy, Homemade, Know-What-Is-In-There, Spongy, Airy and Heavenly Génoise Cake! A Spongy and Airy Genoise Cake Smothered with Luscious Whipped Cream and topped with a Very Peachy Peach Layer, there are no better Lovers! Preheat oven to 180˚C and spray pans with cooking spray or grease with butter, line with parchment paper and then grease again. Combine flour and instant yeast in a bowl and set aside. Add vanilla extract to melted butter and set aside. Set a pan of simmering water on medium-low heat. Combine eggs and sugar in a large heatproof bowl and place it over the pan with the simmering water. Ensure that the base of the bowl doesn't touch the water. Using your hand mixer, beat the eggs with the sugar until fluffy, doubled in volume and looks pale yellow. (Almost whitish) - This should take about 9-11 minutes. At this point, remove the bowl from the sauce pan and keep beating until the mixture has cooled. Finally fold in the butter, making sure you do this step in the most delicate and quick way! You do not want to deflate the batter. Divide the batter in the two cake pans and bake for 15 minutes! Meanwhile, make the syrup by bringing water and sugar to a boil for 10-15 minutes. Bring off the heat and add the vanilla extract. After baking, allow the cakes to cool upside down on a cooling rack. Moisten the sponge cakes with enough syrup and set them aside. Using your hand or stand mixer (See Note 6) beat whipping cream until it starts just to thicken. Then add the icing sugar and vanilla extract and beat until thick with stiff peaks. Place your first sponge on a cake board or plate, whatever you choose to. A turntable is a winning ticket here! Spread with a fine and even layer of whipped cream and then place the other sponge cake on top. Spread with another even layer of whipped cream. 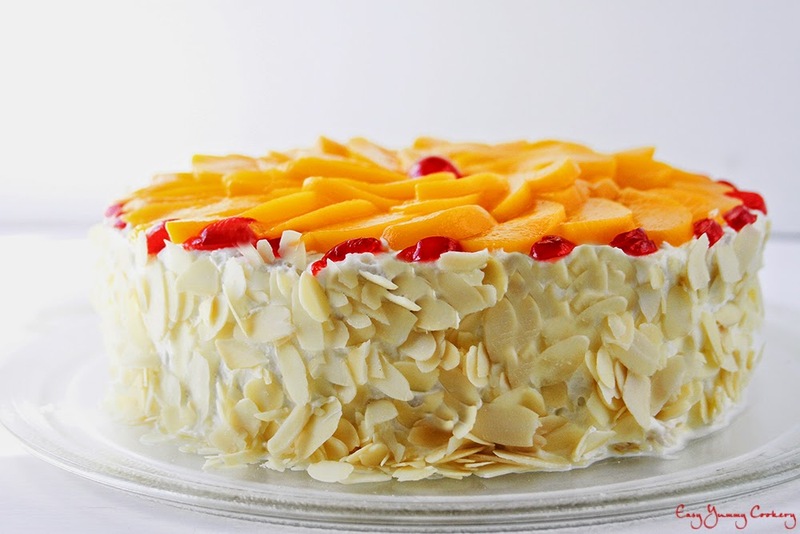 Cover the sides of the cake and finally with almond flakes. 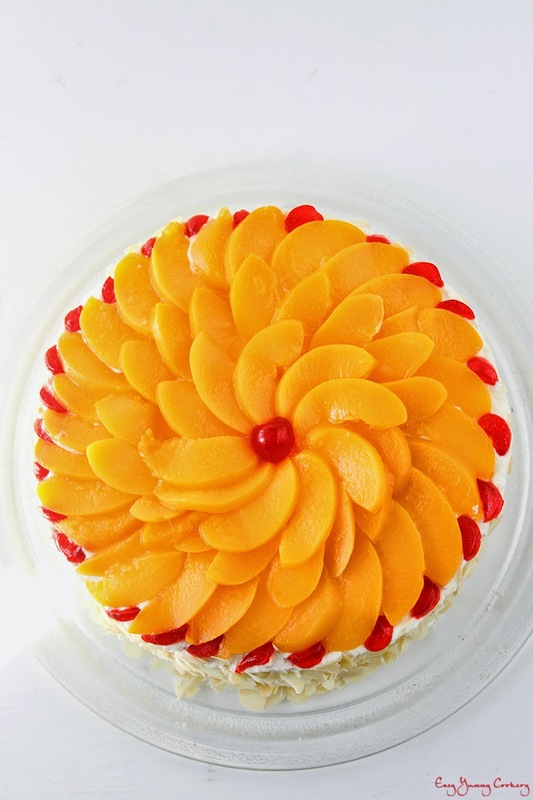 Decorate the top layer with sliced peaches, you can add some glacées cherries if you wish! 1. Eggs at room temperature, beat and fluff better than cold eggs. 2. Genoise is a special kind of sponge cake and does not generally contain any leavening agent. However, I use it, as I find it makes the cake more light and airy. You can always skip the instant yeast. 3. You can omit making the syrup and use the one from the canned peaches. It's totally up to you! 4. You can omit the icing sugar as well when whipping the cream, but it acts as a stabilizer and will stop your whipped cream from melting off and stand longer. 5. Please, please, puh-lease, make sure you do fold in the flour as smooth as you can. If you just go about mixing it without gentle folding, you will end up with a deflated batter and probably end up with one cake instead of 2! 6. It is best if you chill the bowl and the beaters of your hand/stand mixer before beating the whipping cream. 7. A little extra trick is to place the bowl of the whipping cream in a cold bain marie and to beat until fluffy! It stands longer, I hear! Here are the cake updates he sent me! This is, soooo not fair! I know! But I guess, the pleasure of feeding is above everything else! wow... this looks so good!! !